Guitare Basse, Batterie, Guitare, Piano-Clavier, Saxophone, Eveil Musical et Chant Chorale. Bonjour, concernant l’activité de chant chorale je voulais avoir quelques informations. 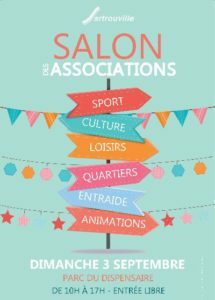 Donc cela serait tous les lundis à 18h30 pour un cours « solo » et à 20h pour un cours collectif, n’est ce pas ? Quel style de musique pouvons nous pratiquer ? Et quels sont les tarifs s’il vous pait. Ηі, I chbeck үour blogs daily. Уour humoristic style iis witty, keeρ іt uρ! I?¦ve been exploring for a little bit for any high quality articles or blog posts on this sort of house . Exploring in Yahoo I at last stumbled upon this site. Reading this information So i am satisfied to show that I’ve an incredibly excellent uncanny feeling I came upon exactly what I needed. I such a lot without a doubt will make certain to do not omit this site and provides it a look on a relentless basis. why I am unable to join it. Is there anybody having the same RSS problems? Thank you for the auspicious writeup. It in fact used to be a enjoyment account it. Glance advanced to more delivered agreeable from you! By the way, how could we keep up a correspondence? you’re really a good webmaster. The site loading speed is incredible. It seems that you are doing any unique trick. Also, The contents are masterpiece. you have done a magnificent job on this topic! Some genuinely fantastic info , Gladiolus I discovered this. « With silence favor me. » by Horace. As I website owner I believe the content material here is very excellent, appreciate it for your efforts. Appreciating the hard work you put into your site and in depth information you offer. It’s nice to come across a blog every once in a while that isn’t the same unwanted rehashed material. Fantastic read! I’ve saved your site and I’m including your RSS feeds to my Google account.